Nanotechnology involves the manipulation of materials and the creation of structures and systems that exist at the scale of atoms and molecules. A nanometer (nm) is one billionth of a meter. By way of comparison, a DNA molecule is roughly 2.5 nm, a red blood cell 7,000 nm and a human hair cell a whopping 80,000 nm wide. The existing body of toxicological literature indicates that nanoparticles have a greater risk of toxicity than larger particles. The *particle sniffer* prototype by the Particle Development Team is a sniff-scan technology that captures nano-scale elements, such as nanoparticles of carbon 60, titanium dioxide and zinc oxide that have clustered on or beneath the skin of individuals who have unknowingly been using nano-based particle products ranging from transparent suntan lotions, a large number skin care products, and a wide variety of makeup products to some types of fabrics. The *Particle Sniffer* sonic-simulation installation is based on a nano-sized surface acoustic wave chip, which works by measuring disturbances in sound waves as they pass across micro-quartz crystals. This “dog on a chip” sensor is coated with a thin layer of cloned antibody proteins that bond to specific particles, such as carbon 60. The sound waves passing through that sensor can then be compared with an uncoated control crystal: differences in the waves mean the chip has picked up trace amounts of the target particles. Each time an individual passes through the installation and a particle is captured, the installation alerts the individual to the level of trans-patented particle traces that have been found on him or her; and to the toxicity tales of others that have had nano-clusters found on them or in them. *particle group* is a collective consisting of Principal Investigators Ricardo Dominguez and Diane Ludin, as well as Principal Researchers Nina Waisman (Interactive Sound Installation design) and poet Amy Sara Carroll, with a number of other collaborators participating temporarily (since 2006). The collective draws from sonification, poetry, and the hard and social sciences to develop installations that are critically engaged with the politics and poetics of nano-science and its market. Their aim with the installation Particles of Interest is to shed light on both the lack of regulation of nanoparticles in consumer goods and the emergence of the nano-sublime. The group combines digital technology, investigative research, and multimedia formats into works that forge a subversive relationship with the newest frontiers of nano-science. 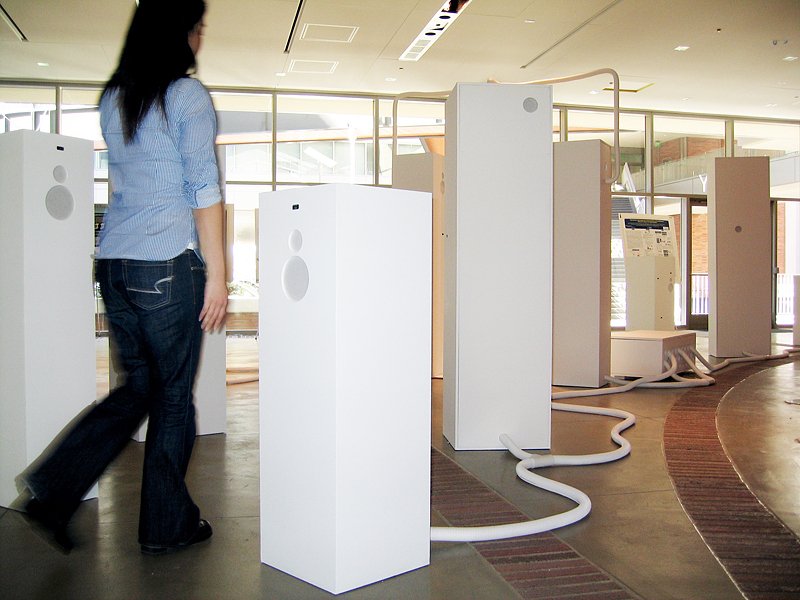 The *particle group* exhibited at ISEA 2006, House of World Cultures, Berlin; San Diego Museum of Art, San Diego, CA, 2007; Oi Futuro (Brazil) and Gallery@CALIT2 in 2008. The *particle group* is funded by Calit2 and the UCSD Division of Arts and Humanities.